I wanted to repost an article i though was very helpful to understand spinal decompression as an industry today. An old football injury that was reinjured when lifting heavy furniture sent Edgar Guzman looking for a nonsurgical way to relieve the pain. He spent his lunch hours on the spinal decompression machine in Dr. Luis Crespo's office. Dr. Luis Crespo demonstrates how the spinal decompression machine works with a model of a vertebra. Over the past five years, three medical device companies with ties to the Tampa Bay area have been in fierce competition for a multimillion dollar market: people with lower back pain. The companies manufacture high-priced, high-tech traction tables that they promote to doctors and chiropractors as a nonsurgical alternative for patients with herniated discs and other chronic back ailments. Sales are strong despite one major obstacle: Medicare and many major insurers refuse to reimburse for the expensive treatment, known as vertebral axial decompression or spinal decompression. There may be good reason for the disconnect. Customers and manufacturers' employees have claimed the device-makers deliberately mislead doctors to think the treatment is reimbursable, even suggesting inappropriate procedure codes to use when billing insurers. The manufacturers - Vax-D Technologies LLC in Oldsmar, Axiom Worldwide in Tampa and North American Medical Corp. in Atlanta - have denied the charges and say insurance matters are the doctors' responsibility, not theirs. Regardless of who is responsible, big bucks are at stake. The tables, which look like medieval racks with computerized consoles, sell for $65,000 to $125,000. The manufacturers recommend patients receive 16 to 20 sessions, with reimbursements estimated at between $185 and $300 per session. An industry newsletter, the Anesthesia & Pain Coder's Pink Sheet, investigated the spinal decompression industry in its December issue after getting a coding inquiry from a subscriber. The Rockville, Md. publication, which writes about medical billing and coding issues in the pain management field, conducted an anonymous survey of subscribers who owned or had owned decompression tables. Three-quarters of the practices that responded said they were given advice on how to bill Medicare when they bought the tables, despite the fact Medicare does not reimburse for treatments on the table. Based on survey responses, the publication estimated that erroneous claims to Medicare and private insurers for spinal decompression could amount to more than $67-million annually. - Two brothers, chiropractors in Georgia, were sentenced to 34 months in jail after pleading guilty to defrauding Blue Cross and Blue Shield of Georgia of more than $1-million for treatments on the Vax-D device. - A doctor in Indiana had to repay Medicare about $75,000 for wrongly billed procedures on an Accu-Spina table made by North American Medical. - And an osteopathic surgeon in Pennsylvania was dunned by several insurers for repayment after he had billed them incorrectly for treatment on Axiom's DRX9000. "When I bought the machine, I was assured all insurance companies paid for it," said Dr. Bernie Zeliger of Harrisburg, who bought the Axiom table in January 2005. "But when I submitted the first bill, I found out in a hurry that they didn't." Axiom said it does not give billing advice, but refers customers to an unaffiliated company with such expertise. The man who is widely credited with starting the spinal decompression business is Vax-D's founder, Allan Dyer, a Canadian doctor who moved his company to Pinellas County in 1994. Dyer, who served two years as a deputy minister of health in Ontario, is described in company materials as an inveterate tinkerer who experimented with early models of a heart defibrillator on dogs. When back pain put Dyer in a wheelchair, he and his wife, Natalie, began creating a computerized version of the mechanical traction table. Dr. Lawrence Dyer, Vax-D's vice president and an oral surgeon, said after six years of research his parents had developed a table, "which, remarkably, could reverse the chronic pain and symptoms of herniated discs and degenerative disc disease." The Vax-D device calls for the patient to lay face-down on a divided padded table, harnessed at the shoulders and hips, while the table slowly separates, then retracts. The company claims the treatment has proven to be "88 percent effective" in treating low back pain. The company sold its first table in 1990 and says more than 400 are in use. Vax-D's success spawned competitors. Nicholas Exarhos, a chiropractor who once sold Vax-D machines, joined Cluster Technologies, a Sarasota company that made a similar device, in 1995. Exarhos and James J. Gibson, an accountant who was Cluster's president, left in 2000 and formed Axiom in Tampa. Axiom sold its first machine in 2001. Carlos Becerra replaced Gibson at Cluster. Becerra is a Colombian immigrant and entrepreneur who refueled planes at New York's Kennedy airport when he arrived in the United States in the 1970s. By September 2000, Cluster had filed to reorganize under Chapter 11; in February 2005, the company filed for Chapter 7 liquidation. By then, Becerra had formed North American Medical, which began sales in 2001. Becerra, with other Cluster executives and North American Medical, were sued in June by the trustee for Cluster's bankruptcy, alleging the group stole the company's spinal decompression technology for the new company. Becerra, who did not respond to a request for an interview, has in proceedings denied such charges. Today, Axiom, North American Medical and Vax-D are among a handful of players in the highly competitive spinal decompression business. Though many of the executives are former colleagues, they battle bare-knuckles for market share, in doctors' offices and in a raft of lawsuits claiming everything from patent infringement to corporate espionage to employee poaching. In one case that was recently dropped, Axiom sued a Denver chiropractor who canceled his order before delivery. All three companies declined in-person interviews for this story and replied only to written questions. Steve Brown, chief executive of DVAD USA in Carlsbad, Calif., which sells Vax-D machines, has been in the medical device business for years, but is surprised by the intensity of his competitors. "I've never seen anything as Machiavellian as the decompression industry," he said. Though their machines differ slightly, each manufacturer promises one thing: nonsurgical and long-lasting relief from most forms of back pain. Dr. Luis Crespo, a Tampa doctor who advertises his Axiom machine on TV commercials and in high-end magazines, said that after three and a half years of using the device on patients, he has had a 96 percent success rate. "Since I started this practice in 1996, I've dealt with a lot of spine injuries," said Crespo, who was emergency medical director at Memorial and Town and Country hospitals before entering private practice. "And till now, surgery was often the only thing available." During an interview, Crespo used a model of the spine with a rubber disc wedged between plastic vertebrae to illustrate how decompression works. 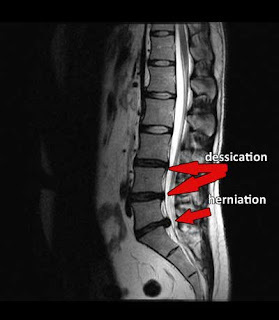 A herniated disc, he said, is like a jelly doughnut with the jelly squirting out. "The Axiom machine gently pulls the vertebrae apart and allows the jelly to go back in," said Crespo, who recommends the procedure for patients with degenerative disease, sciatica or posterior facet syndrome. Patients who are pregnant or who have had screws or rods previously inserted in their spines are not appropriate for the treatment. Crespo said about 10 percent of his patients undergo spinal decompression, which is administered in 20 treatments, each about an hour long, over 5 weeks. Crespo recommends that patients follow decompression with six to eight weeks of strengthening exercises at his office. "Anyone who undergoes decompression has to undergo core strengthening," he said. "Or it is all for naught." Despite Crespo's enthusiasm and reams of scientific-looking reports supporting the procedure on the manufacturers' Web sites, Medicare and most major insurers remain unconvinced of its effectiveness. A spokesman for Blue Cross and Blue Shield of Florida said the state's largest insurer decided to deny coverage "after extensive study and consideration of the effectiveness of the procedure." Similar responses came from Aetna, Humana, Cigna HealthCare and UnitedHealthcare. Medicare's policy is clear: "There is insufficient scientific data to support the benefits of this technique." Dr. Joel Press, president of the North American Spine Society, which represents spine specialists from a variety of fields, said his group is preparing a position paper on spinal decompression. "People are asking if there is any benefit (to decompression) at all because the science is pretty thin," said Press, who is medical director of the Spine and Sports Rehab Center at the Rehabilitation Institute of Chicago. "A lot of patients are coming back, saying there's not a lot of change in their symptoms for a lot of money." Proponents of spinal decompression often suggest that surgeons dismiss the less invasive procedure in order to protect their higher-paying specialty. But Press, whose group is about 50 percent spine surgeons, with the rest representing other medical specialties, said his members will judge decompression strictly on the science. "If there is truly something beneficial to the patient, you should be able to do good quality research on it," he said. "And you want something that is truly randomized, not 50 people in a row saying they did great. But it is very difficult to have a simple solution to a complex problem like chronic back pain." While scientists study the treatments and insurers chase doctors who bill for the procedure, one manufacturer is focusing on cash-paying customers. During daylong seminars at its Tampa headquarters, Axiom executives and consultant Dr. Ben Altadonna tell chiropractors from across the country that spinal decompression is the road to riches. In a workshop called "How to make an additional $35,000-$50,000 per month, Cash!!" Altadonna presents success lessons from Harry Houdini and testimonials from satisfied customers like one doctor, quoted in marketing materials as saying "I collected $22,000 JUST TODAY!!!! This is some wild ride Ben Altadonna, thanks for inviting me." Dr. Eric Liners, a chiropractor in Salinas, Calif., attended one of Altadonna's seminars at Axiom's office in late February 2005 with about 40 chiropractors. In a lawsuit filed against Axiom and its finance company in March, Liners said Altadonna projected that his practice's profit could increase to $1.76-million over five years with an Axiom machine. According to the complaint, which was filed in U.S. District Court in eastern Pennsylvania, at the end of the seminar Liners agreed to buy a machine for $125,000. However, the chiropractor claimed the device repeatedly malfunctioned and "physically molested Liners Chiropractic's patients." "Virtually all of the patients placed in treatment showed no objective signs of favorable response," the lawsuit said, adding, "Axiom's financial projections ... proved grossly misleading." After four months, Axiom removed the machine from Liners' practice; the lawsuit erupted after the leasing company sued the chiropractor for failing to continue making payments. Liners voluntarily dismissed his claim against Axiom shortly after it was filed and in April the remaining parties reached a confidential settlement. In a written statement, Axiom's attorney, L. Joseph Shaheen, Jr., said the company "has asserted that Liners' claims were untrue and frivolous." Crespo, the Tampa doctor, said marketing spinal decompression as a money-maker is a mistake. "If you're buying the machine to try to make a huge bang on it, you can't do it," he said. "You'll end up decompressing a lot of patients out there who do not need it." A longtime critic of the insurance industry, Crespo said he does not participate in Medicare nor does he belong to insurance networks, though he is an out-of-network provider for PPOs. Though he said Axiom told his office to use a billing code that applies to physical therapy when billing insurers for decompression, Crespo said most of his patients pay out of pocket. Axiom said it does not give billing advice and most of its doctors charge on a cash basis. Crespo's fee for decompression with core strengthening is $8,000. "My patients are glad to pay cash," said Crespo, who recently moved to new offices in the Westshore area and was considering adding a second Axiom machine. "We take checks and credit cards." In interviews, three of Crespo's patients said they were happy with the results of decompression, saying it had significantly reduced their pain and discomfort. But only one patient paid cash and that individual was uninsured. One of the others, Edgar J. Guzman, is a personal injury lawyer in Tampa who was treated by Crespo in March. Guzman said he had about 18 sessions but was unable to complete the treatments or do strength training because of lack of time. "Thank god, it really worked out," said Guzman, who had a herniated disc. "More than anything it provided more flexibility and stretched out the muscle that was tight there." Nor was cost an issue. Despite the fact that his carrier has a policy against reimbursing for spinal decompression, Guzman didn't get a bill. "My insurance covered it," said Guzman, who did not want his carrier identified.